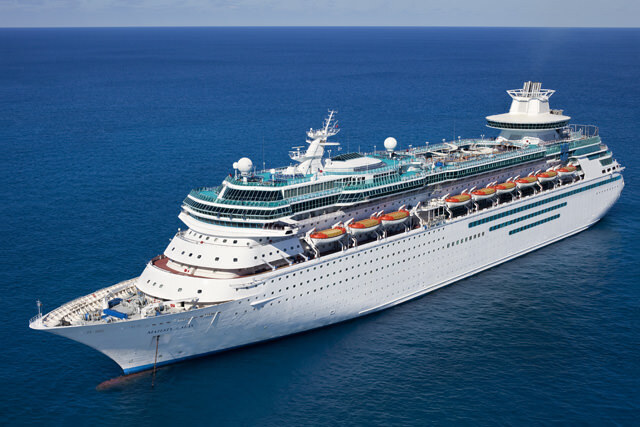 In the cruise business, twenty years might as well be a century, so the 73,941-ton, 2,390-guest Majesty of the Seas, launched way back in 1992, is a veritable antique, with a shiny 1980s/1990s look and her fair share of the bumps and bruises that come with twenty years of hard cruising. Unlike almost any other cruise ship, Monarch and her sister ship, Majesty, are arranged with the majority of their cabins toward the front of the ship and the majority of their public areas toward the back, with a five-story atrium acting as the dividing line. 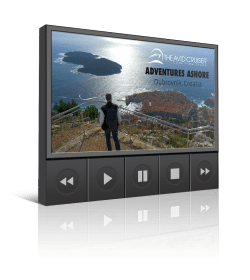 There are several pluses to this arrangement, including making it easier to hop from nightspot to nightspot, and also minimizing noise from the louder public rooms seeping through to the staterooms. On Deck 5, you’ll find the popular, nautically themed Schooner piano bar, the sprawling Casino Royale, and the multi-level Chorus Line theater, plus several shops and Latte-tudes, a specialty coffee bar. 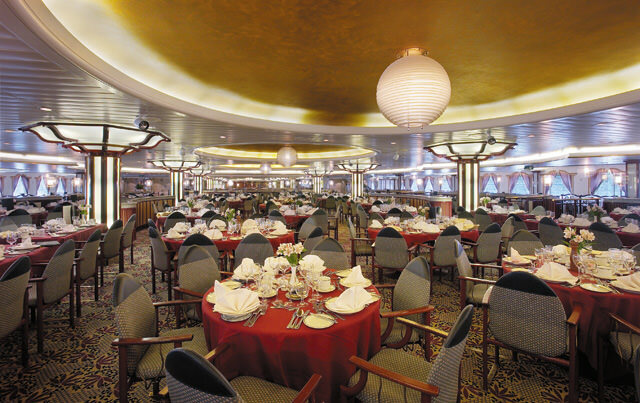 Other lounges scattered around the ship include Boleros, featuring Latin music and drinks; the Spectrum Lounge for small-scale entertainment and dancing; and the Viking Crown Lounge, perched at the top of the ship on Deck 12 and acting as an observation lounge by day and a dance club by night. For kids, the Adventure Ocean club in the stern on Deck 10 offers activities and play opportunities for kids 3 and up. One deck above, there’s a teen club and video arcade. Outside, Majesty offers two good-size swimming pools on the wide-open, one-level pool deck, which can get very crowded on sunny days. Quieter sunning spaces can be found on the tiered aft decks and elsewhere on the top decks. 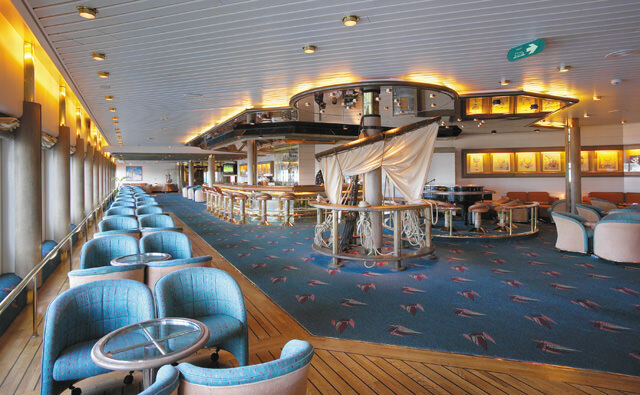 The Sports Court, high in the stern on Deck 11, has a basketball/volleyball court and Ping-Pong tables. One deck up there’s a rock-climbing wall, and two decks down there’s the half-moon-shaped gym, which offers good aft views from its treadmills, stationary bikes, and step machines. There’s also a small spa and beauty salon, and an aerobics area. Dinner is served in twin one-level dining rooms called Moonlight and Starlight. More casual dining is available at the Windjammer buffet restaurant on Deck 11; the 1950s-style Johnny Rockets diner, serving a classic burgers-and-shakes menu; and a pizzeria called Sorrento’s. Staterooms are small and no-frills, with standard outside cabins measuring only 120 square feet, with tiny bathrooms and small closets — but on the other hand, Majesty sails only 3- and 4-night cruises, so how much space do you need? 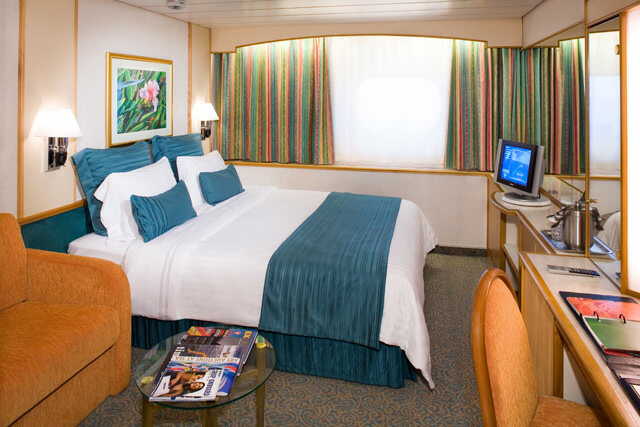 Only 62 of the 1,177 staterooms and suites aboard have private verandas. For more space, you can bump up to a 221-square-foot Junior Suite, which has a 61-square-foot veranda. 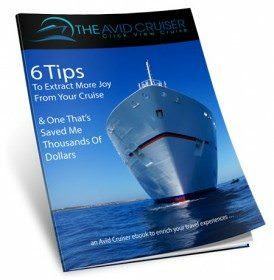 The ship’s top accommodation, the Royal Suite, measures 700 square feet and offers separate living room and bedroom, a dining area, a whirlpool bathtub, and a 147-square-foot balcony.